RCPTT can now test Eclipse RAP applications! Find more in RAP documentation. On June, 26, we've released Neon-based version of RCP Testing Tool as participants of Simultaneous Neon Release. RCPTT IDE is migrated from Mars to Neon to allow users to install it into their developer Eclipse installations. For RCPTT IDE assertion filtering was introduced helping to search by asserted value or property. The review information is available here and the latest version can be downloaded from Downloads page. You can also install RCPTT as an eclipse plugin from an Update Site or from Eclipse Marketplace. Both ways have obvious restrictions making their usage not very user-friendly, so we decided to implement a new read-file ECL command to get a file content. We are on Mars now! On June, 24, we've released Mars-based version of RCP Testing Tool as participants of Simultaneous Mars Release. 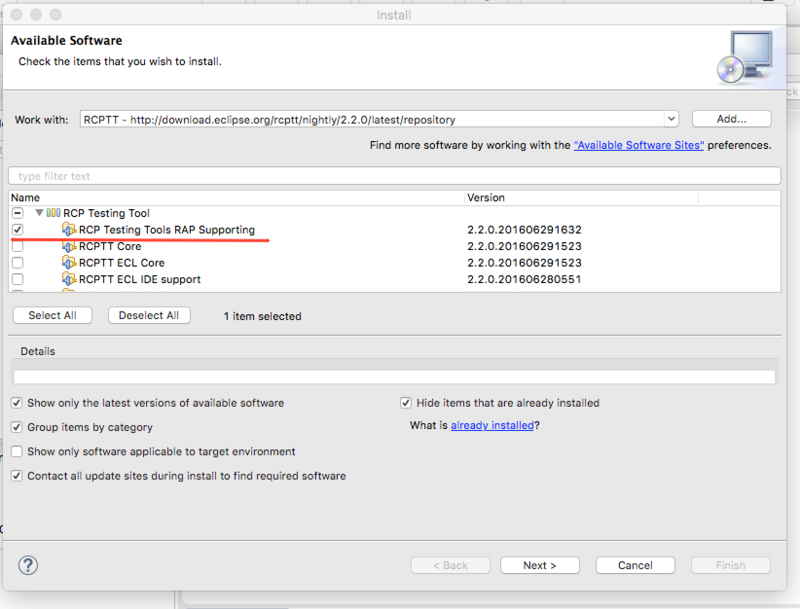 So RCPTT IDE has migrated from Indigo to Mars to allow users to install it into their developer Eclipse installations. Test Runner is now free and Open Source. This is the first release of Open Source RCPTT Runner. Modern Development Environment supporting debugging and refactoring. Test Runner allowing to run your tests locally and in integration with Jenkins, Hudson, or other CI tools. RCPTT Test Runner tests Eclipse-based applications by executing RCPTT tests unattended, on a regular basis. It provides a command line interface and a Maven plugin and establishes seamless integration of your GUI tests with your favourite toolchain. We are happy to celebrate RCPTT project graduation from incubation to mature! P.S. : Will miss the egg. It was cute, though. In this blogpost we are going to describe how to configure Eclipse to combine RCPTT UI tests with code coverage analytics tools EclEmma and Jacoco agent. All of that tools are open source and can be downloaded for free. So I didn't find any hint of Code Coverage in RCP Testing Tool, does that mean there is none? RCPTT is UI testing tool so it is mostly useful for functional testing. Since it is common practice to combine Functional Testing and Code Coverage analysis, we decided to publish this instruction page. We don't provide this functionality out-of-the-box but it is easy to employ AUT virtual machine arguments to configure an arbitrary covers tool. Find instructions below to configure IDE and add analysis to CI with Maven.